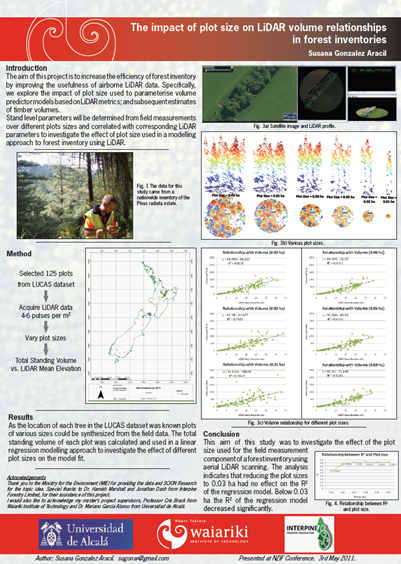 Susana Gonzalez Aracil recently won the NZ Institute of Forestry Annual Conference Student Research Poster Competition. Susana’s poster was based on some of her research work on LiDAR metrics and plot modelling. Susana is completing her internship in New Zealand with the Interpine team located full time at our offices in Rotorua. Her poster looked into increasing the efficiency of forest inventory by improving the usefulness of airborne LiDAR data. Specifically, she explored the impact of plot size used to parameterise volume predictor models based on LiDAR metrics; and subsequent estimates of timber volumes. 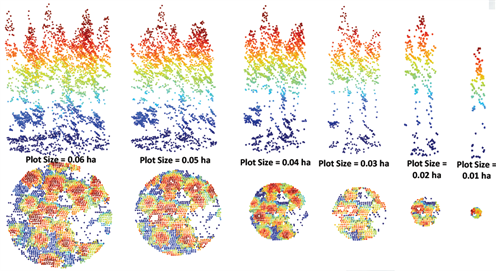 Stand level parameters were determined from field measurements over different plots sizes and correlated with corresponding LiDAR parameters to investigate the effect of plot size used in a modelling approach to forest inventory using LiDAR. The study involved extracting 125 plots from the LUCAS datasets, and segmenting LiDAR data (4-6 pulses per m2) for the plots. Plots sizes were then varied, looking at total standing volume as the predictor variable. As the location of trees were known, plot sizes could easily be synthesized from the field data, and also segmented from LiDAR datasets. Thank you to the Ministry for the Environment (MfE) for providing the data and SCION Research for the topic idea. Special thanks to Dr. Hamish Marshall and Jonathan Dash from Interpine Forestry Limited, for their assistance of this project. I would also like to acknowledge my master’s project supervisors, Professor Cris Brack from Waiariki Institute of Technology and Dr. Mariano García Alonso from Universidad de Alcalá.